Velo Celt: What happened to the wreck of the Silver Spray? What happened to the wreck of the Silver Spray? My daily commute to work along the Lake Michigan shoreline takes me right past an interesting submerged geological feature and the site of the only Lake Michigan shipwreck visible from the shore. For years, I saw this angular black shape poking out just a little above the surface of the water. I'd see it as I drove by in my car, and later as I started commuting to work by bicycle I got a better look at it but was still mystified as to what I was seeing. I know now that angular shape I was seeing was the boiler of the Silver Spray, a steam-powered ferry that ran aground in 1914 on the limestone shoal that juts into the lake at 49th street. Mysteriously though, as I began commuting to work earlier this year in late March, early April I couldn't see the dark, angular shape of the Silver Spray's boiler peeking above the waves. With a stormy beginning to the year, I assumed that the waves were always a bit too choppy to allow me to see the boiler as I rode past. Occasionally, when the waters were more calm, I'd look for the familiar sign post of the wreck but I still couldn't see it. More on the Silver Spray's vanishing act in a minute though. First a little bit of history. 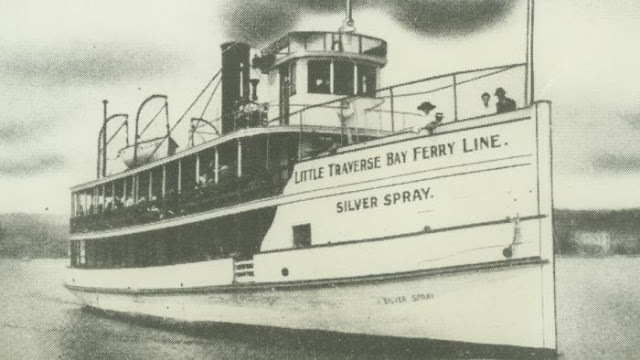 The Silver Spray was a 109 foot long, wooden steamship ferry that conveyed passengers up and down the coast of Lake Michigan back at the turn of the century. On July 18, 1914 she was set to pick up about 200 students from the University of Chicago in Hyde Park and ferry them down to tour the steel mills in Gary, Indiana when she ran aground on Morgan Shoal and subsequently broke up during salvage operations. Her wood hull broke up and as chunks of it washed ashore, curious onlookers burned it in bonfires that lit their parties as they spectated the shipwreck and failed salvage operation. All that remains of the Silver Spray are her boiler and firebox, only a small portion of that massive structure being what is visible from the shoreline. Swimming out to the wreck, something I have yet to do, will allow you to also see a massive anchor chain, 50 foot long propeller drive shaft, and propeller that is as tall as a man. Hyde Park resident Dan Peterman became fascinated by the wreck several years ago and has become a kind of local custodian and tour guide promoting the wreck and championing it to the city in hopes that eventually the wreck and the limestone structure of 300 million-year-old Morgan Shoal will become a marine sanctuary. During summer months, Peterman regularly leads guided tours of the wreck on Sundays, for curious swimmers. Peterman lead groups out to the boiler and around the sunken remains of the wreck and the unique structure of Morgan Shoal, itself a unique feature along the Lake Michigan coastline left over from the Great Lakes glacial creation. Due to the shallow nature of the shoal, on the calmest days the pale yellowish-brown color of the rock can make it visible even from the shoreline, and it's unique structure provides habitat for numerous species of fish and aquatic plants. For years I've seen this reminder of the wreck, the angular boiler peeking above the waves. Only a couple years ago did I finally come up with the right combination of internet search terms to figure out just what it was that I was seeing all these years. 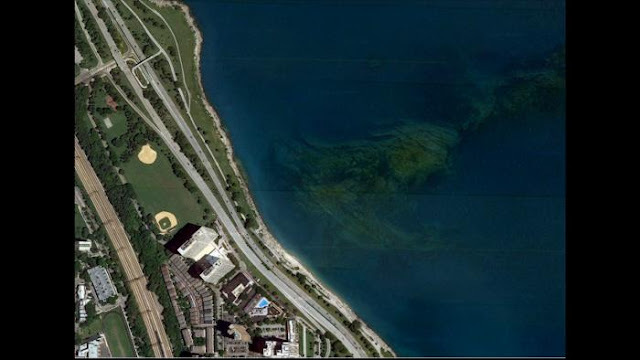 For the longest time I thought it was simply a large angular rock since much of the shoreline of Lake Michigan along the Chicago "coast" was stabilized by large blocks of stone and concrete rip-rap. As the water seemed more shallow in that area, I had always assumed it was simply one of those giant pieces of rip-rap that got dumped a bit too far from shore. Imagine my thrill as minor history buff, when I finally learned that it was no rock but was instead the visible portion of a boiler from a shipwreck! Fast forward to this Spring and my commutes to work and the puzzling absence of the boiler standing proud of the surface of the lake. Recently, as there have been some days of glassy calm on the lake, I expected to be able to see the wreck again, all to no avail. There had been several very strong storms to hit the Chicago area earlier in the spring and I wondered if somehow the extreme battering waves had dislodged part of the wreck and caused it sink below the waves. Just today though, I happened to be perusing an article featuring interesting facts about The Great Lakes, when a news article caught my eye. Apparently, the water levels of Lake Michigan, and Lake Huron are at the highest they've been in 17 years! So, it would appear that the boiler of the Silver Spray, which at the best of times barely projects above the surface of the water has been submerged beneath rising lake levels for the time being. Water levels typically peak on the lakes during the summer and will subside later in the year. 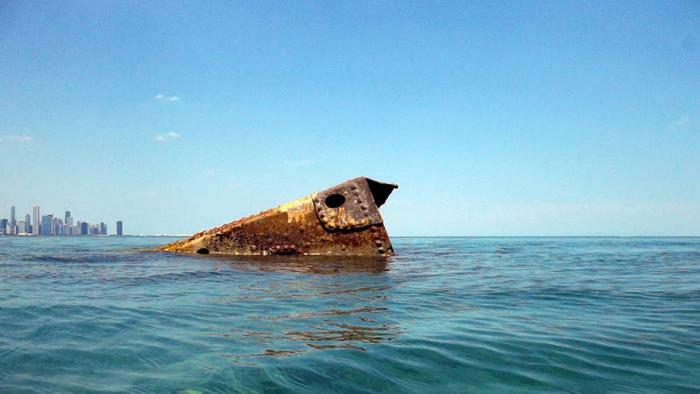 Maybe by Fall and early Winter, the familiar sight of the wreck of the Silver Spray will once again become visible to me as I gaze out at The Big Lake as I ride to work. All photos in this blog post have been attributed to their original source and were taken from the Chicago Tonight article. This is indeed fascinating, I didn't know about the ship or the shoal. I'm neither a boater nor a swimmer, but it seems like there ought to be some kind of navigational aids like buoys or something to keep boats from running into this shoal, especially if the firebox of the ship is totally submerged.